Slow Theory: ‘Queering and Quaring Virtual Space,’ Runway: Space, December 2017. 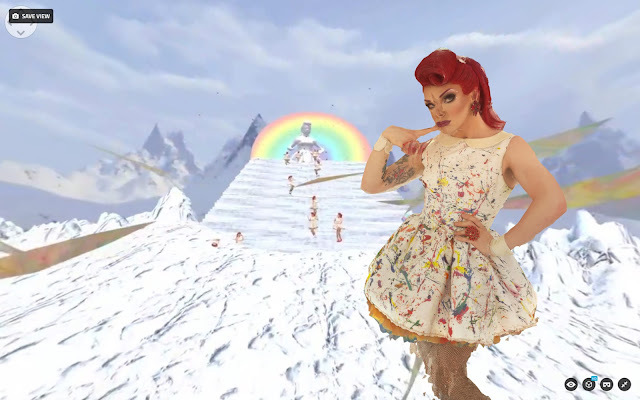 ‘Queering and Quaring Virtual Space,’ Runway: Space, December 2017. Screen grab from Virtual Drag. ‘Virtual Drag Presentation for UNIT Festival’, 2017. Virtual Reality (VR), as put forth via the gaming and film industries, involves the design and crafting of virtual 3D environments, as well as characters and interactions within these settings, often accessed through a viewfinder-headset and other devices that facilitate an ‘immersive experience.’ Inevitably, certain conditions — for example access to technology and education — determine what kind of VR experiences are made. For this text I followed VR experiences being developed by those whose interests and experiences might not be so well represented in the film and gaming industries, but are nevertheless gaining recognition within the art world. It extends research begun at the ‘Closer’ workshop run by the School of Machines, Making and Make-Believe, Berlin which I attended in July 2017, supported by Create NSW’s 360 Visions virtual reality initiative. More in Runway: Space, iss. 35, December 2017.